Sharing my art is how I express joy. It is also how I vent my frustration. I used to paint pictures of pretty flowers and bucolic scenes. Now, my work sports geishas with guns and ballerinas with baseball bats. Today, a girly hoodlum wearing an ornamented hairdo is more interesting to me than a pot of geraniums. Blame it on 2013—the worst year I could ever remember—starting with the legal battle I fought and won against my former senior apartment landlords who were abusing the elderly residents, and ending with the death of my beloved father. In between, I received a diagnosis of a serious medical condition, moved twice, bid farewell to my cherished 1997 Nissan pickup and reluctantly took part in a few other unpleasant adventures. Once I was content to draw inside the lines and on traditional materials. Now, I want to splatter my anguish all over the place: on mannequins, trash cans, film canisters and anything else I could find that will accept what my rattle can and paint markers have to offer. The outer manifestation of my inner world has to show that this once calm and rational female will tell her story like a geisha-gone-wild. All the turmoil of the past year got me thinking—how do strong women deal with adversity and ultimately triumph? How does a geisha who serves, performs and wears a happy face cope when what she would really like to do is figuratively blow away her misery? Looking for some role models to follow, I came across that of Erin Brockovich, whose story I had heard many years ago. Former beauty queen turned advocate, if Brockovich were a geisha with a gun, her weapon would be an AK-47. Erin’s exhaustive investigation uncovered that Pacific Gas & Electric had been poisoning the small town of Hinkley’s Water for over 30 years. It was because of Erin’s unwavering tenacity that PG&E had been exposed for leaking toxic Chromium 6 into the ground water. This poison affected the health of the population of Hinkley. In 1996, as a result of the largest direct action lawsuit of its kind, spear-headed by Erin and Ed Masry, the utility giant was forced to pay out the largest toxic tort injury settlement in US history: $333 million in damages to more than 600 Hinkley residents. If you follow your heart, if you listen to your gut and if you extend your hand to help another, not for any agenda, but for the sake of humanity, you are going to find the truth. I thought about this as I poured over civil codes and landlord-tenant law to research remedies for the mental and emotional abuse of the elderly. Other than a brief stint at a law firm, I had no formal legal training—only guts and the memory of my father telling me I would make a good lawyer. My father was way ahead of his time when it came to women’s liberation and the prospect of me jumping into the ring with the big boys. While working on the lawsuit, I got a call from my doctor. During a routine physical, lab tests showed I had a serious medical condition. This diagnosis began my journey through a maze of “007s,” (doctors with a license to kill) and drug regimens whose side effects had me seriously considering death as a viable option to the treatments. After consulting a medical advocate and being told that only 20 to 25 percent of the physicians in the United States are any good, I began to familiarize myself with how the human body works, medical jargon and a myriad of studies and journals. I switched back and forth between the medical literature and legal documents, sometimes losing my place between complicated precedents and cells that danced a wild salsa instead of performing their elaborate kabuki theater like they should. Fortunately I found a doctor in Los Angeles who specializes in my affliction to take me on as a patient. He is in that top-tier of good doctors and turned my situation around in a matter of months. Unfortunately, I had to move to LA—after I had just escaped the abusive senior complex and moved to Solana Beach. Prior to 2013, I worked in the style of the French Impressionists and told stories of things belonging to the bourgeoisie. The subjects included wine bottles that stood guard over sumptuous gourmet pastries and produce. I drew portraits of patrician women, both foreign and domestic. I was a geisha with a water pistol back then. When my father passed away the day after Thanksgiving, my whole world shattered. The last piece of glue that was holding me together snapped. I never got to say goodbye. I was in treatment in Los Angeles while he was in the Intensive Care Unit in New Jersey. Only our spiritual fingertips could reach across the continent to touch one last time. He would have loved my geishas. 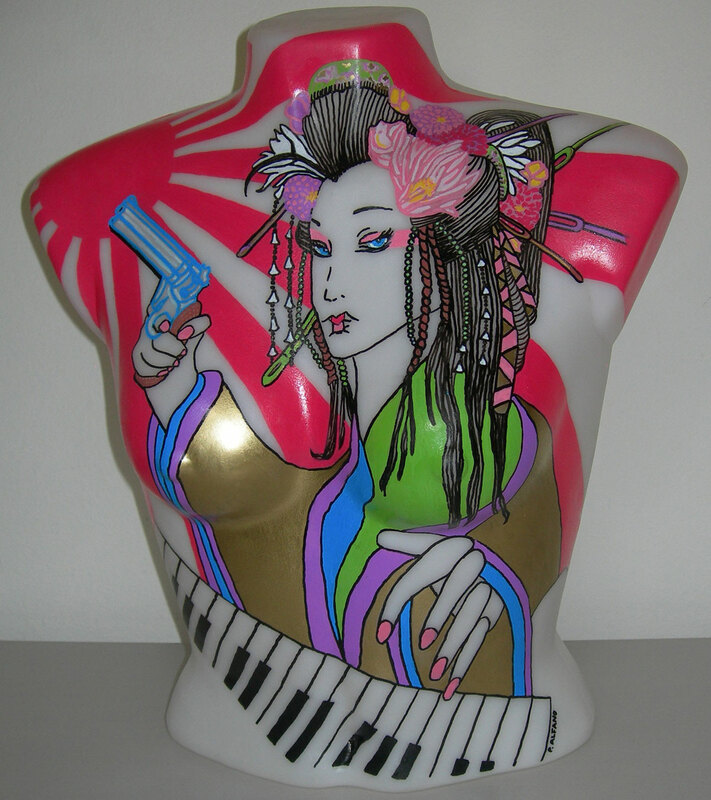 This entry was posted in Art, Culture, death, Family, geisha, Living, Misadventure, Observations, Research and tagged art, culture, elderly, erin brockovich, Family, geisha, guns, law, Living, love, Misadventure, Observations, painted mannequin, spirituality, strong women. Bookmark the permalink. So sorry about your very bad, terrible year, but your art and writing are top notch. Thanks, maggiebird. I’m hoping for better luck in 2014.